An essential tool of virtually every home and business, but especially those located in low lying areas, a sump pump is a submersible pump designed to transfer stormwater away from your basement to the closest municipal storm drain or detention pond. During periods of excessive rainfall, it is not uncommon for water levels to rise substantially in basement and crawlspace sump pits. Depending on the rate of groundwater accumulation, it typically does not take long for these pits to overflow, thereby spilling over onto the surrounding area. A sump pump’s purpose is to stop this from happening. Every residential and commercial plumbing system is designed to capture and reroute incoming stormwater in the most efficient way possible; after flowing into a designated perimeter drain system typically located in a strategic spot on a building’s foundation, the water goes to the sump pit where it is then diverted away from the property. How does the pumping process work? Once the water enters the pit, it activates what is called a float switch on the sump pump. The switch is positioned at a certain height within the pit, usually well below the surface to safeguard against potential flooding. Your home or office may require a retrofit sump pump installation depending on its age; most older properties were not outfitted with these devices, which means you could be at a heightened flooding risk. The pumps themselves come in various sizes, with ⅓, ½, and 3/4 horsepower models being the most popular. A ⅓ HP pump will generally suffice for the vast majority of households, but the crew at Brothers can help you make the right decision for your specific needs. We have performed thousands of sump pump installations for home and business owners in the GTA, and are qualified to install all the leading brands. Since sump pumps are primarily powered by a building’s electrical system (hardwired or plugged into an outlet), it is important to install a battery backup in case of an outage; routine tests should be conducted to ensure the secondary source will do its job when these situations occur. Groundwater contains high volumes of minerals and sediments, and can thus lead to clogs over time. Flushing the system of these deposits on a regular basis will prolong the life of your pump, as well as enhance its performance. 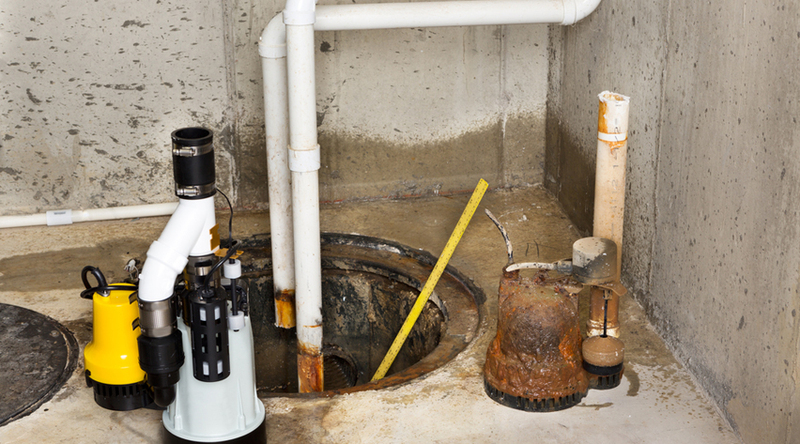 Unlike other plumbing fixture, there is no hard and fast rule for determining the lifespan of a sump pump. Nevertheless, scheduling routine maintenance with the experts at Brothers will maximize the amount of use you get from the machine, and will guarantee its function. If your existing pump needs to be replaced or your building is currently running without one, contact our team today to set up a service appointment. This is one device you definitely need to have, and our team can ensure that yours is kept running smoothly.